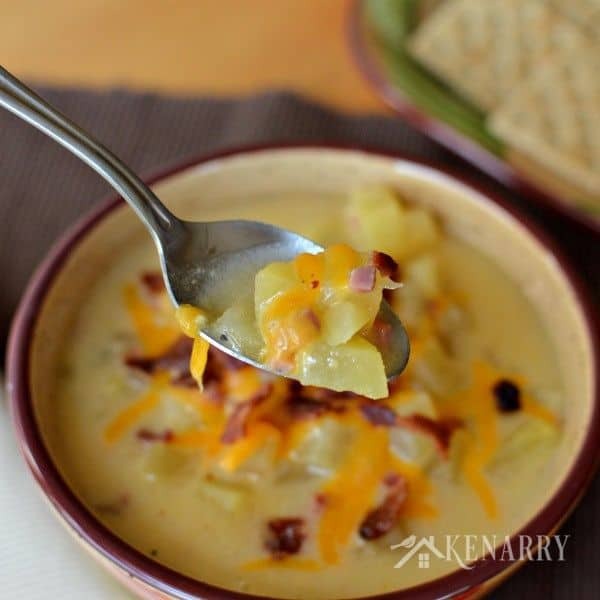 You’ll love this Slow Cooker Loaded Potato Soup packed with bacon, ham and cheese. Creamy soups like this are the perfect comfort food during long winters! Hello, I’m Carrie from Kenarry: Ideas for the Home back again for the second Ideas for the Kitchen exchange, where Ashlyn and I are trading blogs to bring you new recipes and a new voice each month! As we move into cooler fall weather, Ashlyn and I decided it would be a great time to swap slow cooker soup recipes. Today, I’m sharing my recipe for Slow Cooker Loaded Potato Soup packed with bacon, ham and cheesy goodness. Creamy soups like this are a perfect comfort food during the long winters, don’t you think? If you’re looking for Ashlyn, you’ll find her over at Kenarry today where she’s sharing an amazing Crockpot Cheeseburger Soup. She’ll share it with you here in a few weeks, but if you’re anxious to try it sooner head over to Kenarry: Ideas for the Home to check it out! In Michigan, where we live, we’re starting to break out the winter coats, boots, scarves and hats as we prepare for the long winter ahead. With our preparations, we’re also breaking out our slow cookers and trying new recipes to warm us up! I don’t know about you, but I especially crave soup recipes this time of year. 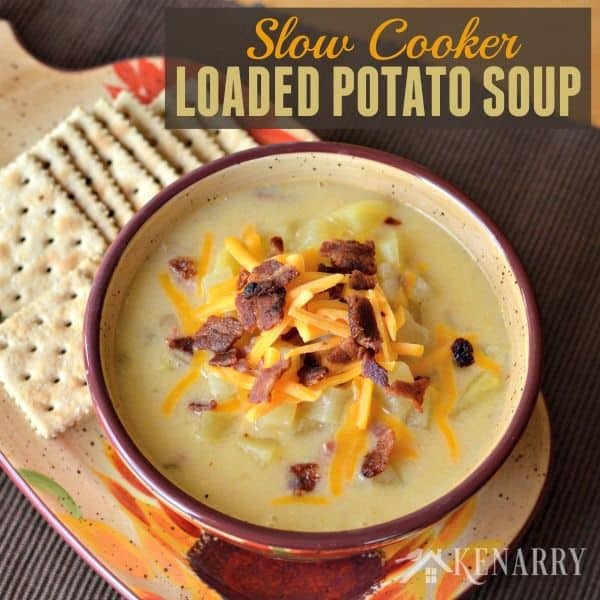 This recipe for Slow Cooker Loaded Potato Soup combines all the flavors you love in a hearty soup fit for the whole family. It’s loaded with tons of ham, big chunks of potato, diced onions, shredded cheddar cheese and of course topped with crispy bacon. Isn’t everything better with bacon? 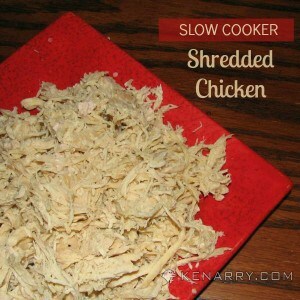 With two small kids at home, slow cooker recipes make my days so much easier. 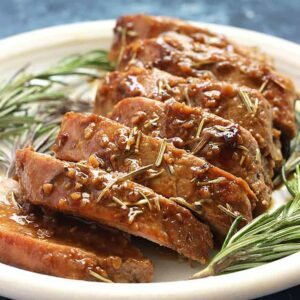 I love simple recipes like this, where you just throw it all in the slow cooker or crock pot in the morning and let the delicious aroma fill the house by dinner time. The only extra step for Slow Cooker Loaded Potato Soup involves adding cheese, milk and flour about an hour before you’re ready to serve it. I learned the hard way if you add milk in the morning, it separates or curdles over the course of the day. 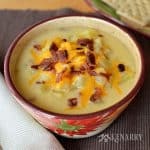 The soup still tastes good, but it doesn’t have the smooth, creamy texture you want in a Slow Cooker Loaded Potato Soup. 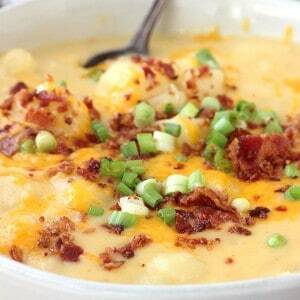 You'll love this Slow Cooker Loaded Potato Soup packed with bacon, ham and cheese. Creamy soups like this are the perfect comfort food during long winters! Wash, peel and dice the potatoes. Place in the bottom of a slow cooker. Add onion, ham, cream of celery soup, vegetable or chicken broth, water, minced garlic and black pepper. Cook on low for 7-8 hours or high for 3-4 hours. You want the potatoes to be tender. An hour before you're ready to serve the soup, add 1 1/2 cups of the shredded cheese. Whisk together flour and milk in a small bowl and pour into the slow cooker. Garnish with the remaining cheese and crumbled bacon bits. Enjoy! 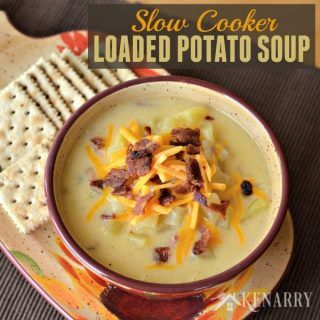 This Slow Cooker Loaded Potato Soup is hearty enough to stand alone as a main course for dinner. It goes great with a side salad and a few slices of your favorite bread. You can also top it with oyster crackers, saltines or large croutons. 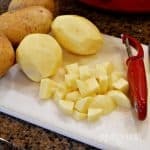 A huge thank you to Ashlyn, for allowing me to trade blogs with her today and share this recipe for Slow Cooker Loaded Potato Soup. I’m excited to be back again next month to share more Ideas for the Kitchen with you. 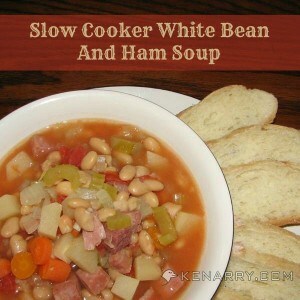 In the meantime, I’d love to know what are your favorite slow cooker soups to warm you up in the winter? Please comment below and share. Ashlyn and I are always looking for new ideas! 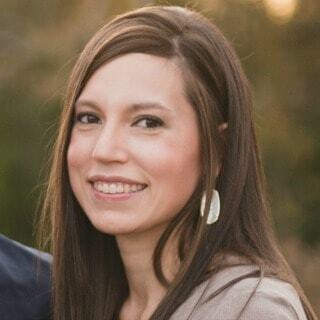 Carrie is a mother of two young boys, who enjoys sharing recipes and trying new craft ideas! At Kenarry: Ideas for the Home, she and her husband share ideas you’ll find useful for your home, including projects they’ve done, recipes they’ve created, products they love and more. 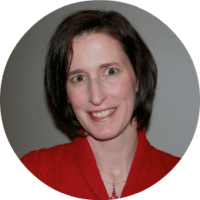 Carrie’s passion, though, is volunteerism and connecting people with opportunities to make a difference in their community. You can connect with Carrie via Google+, Pinterest, Facebook, Twitter and Instagram. 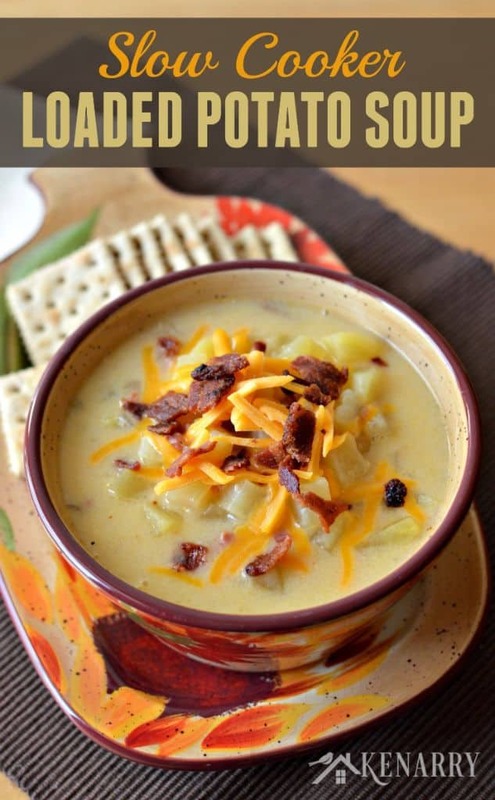 this sounds so comforting and I love potato soup, I would love this and cant wait to try it! This is so warm and cozy! The perfect meal for this time of year! Love these kinda soup – so perfect as one pot meal and I can set it and forget about it . This is going to be on the dinner table soon . I absolutely love soup in the fall and winter!!! And slow cooker recipes are great when you have a busy schedule. Definitely will be trying this recipe out! Now THIS is the kinda comfort food I want all up my face this winter. It looks so so yummy!! This soup looks so comforting! I love the additions of cheese and ham on top. This looks great. Hi Robin! I’m sure that would be fine! This soup was absolutely amazing!! I had been looking for a potato soup for the crockpot and found yours right after Thanksgiving. I admit I wasn’t sure about the cream of celery soup but when I tasted this soup it was Amazing!! Thank you for sharing and keep cooking and sharing your recipes with us. So glad you enjoyed it, Ann! This is one of our favorite soups! Thanks for leaving your sweet comment! Would you possibly know the nutritional facts for 1 serving (1 cup)?? Calories, carbs, sugar etc?? It is to salty,is there anything I can do to fix it? 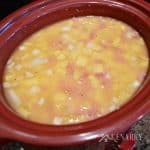 Could you add the bacon in with the soup while it’s cooking in the crockpot? We love bacon in our house, and I think it would add a good flavor! I’m making this tomorrow while I’m at work, and I’m so anxious to see how it turns out! Hi Kassie! I’d say as long as you cook and chop the bacon beforehand, I don’t see why you couldn’t throw it in there with everything else! Maybe even save some for topping at the end. 🙂 Hope y’all enjoyed it! This was yummy for the first cold week here on the Baja coast (yes, it even gets chilly in Mexico!). We can’t get cream of celery soup here, so I substituted cream of squash blossom (never saw that in the States), with great results. I was thinking about trying it with lobster instead of ham next time. It seems like all the ingredients would work. Cream of corn soup could be substituted too, I should think, with lobster. This one’s a keeper–thanks! So glad to hear you enjoyed it, Patricia! Lobster sounds like it would be an amazing addition! I make this with cream of chicken soup a lot, so if you have access to that one, you could try that also! I found your recipe on Pinterest and made it for dinner tonight. I followed your recipe exactly and it was AMAZING! AMAZING AMAZING AMAZING. Thank you! I am so glad to hear that you enjoyed it!! 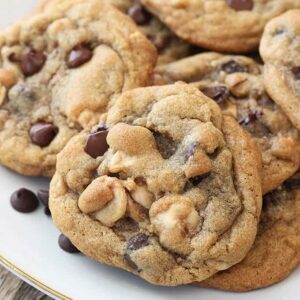 We love this recipe so much, too! Loved this recipe! Will definitely be making again, it was perfect for a cold snow day! Do you cook the ham before you put it in the crockpot? I really don’t think there is anything more comforting on a winter night then a bowl of soup. 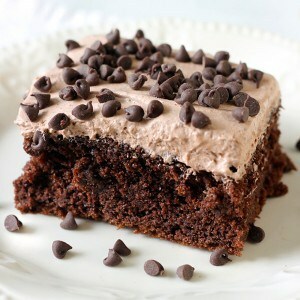 This one looks delicious!! Love this! There is nothing better than a big bowl of potato soup! So comforting on a cold day! This looks so good! I also live in Michigan. My husband and I both work full-time, and we have a toddler, so I am always up for trying a good slow cooker recipe.